Woody's Rum Bar, sister restaurant to Kooper's Tavern and Slainte in Fells Point, now has a taco truck cruising the streets of Baltimore. The world definitely needs more taco trucks, so I was excited. But the first meal I had was a bit disappointing. Tacos come in sets of three, with no mixing and matching. Two of the same tacos in an order is ok, but three is boring. However, the first variety I tried - the pork adobo ones - were not boring. On the contrary, they had entirely too much stuff going on. 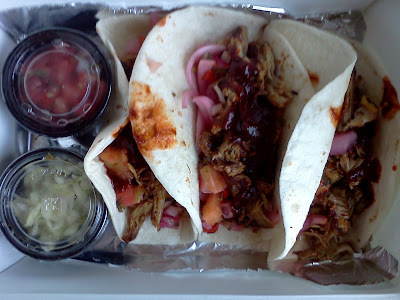 There was the adobo-braised pork, the pickled onions, the pineapple salsa, and a blood orange chile sauce. It was an unrelenting barrage of vinegary flavors which most definitely did not need the pico de gallo or super tangy slaw on the side. Some creamy cheese would have cut the extreme piquancy, but I didn't want to shell out the additional buck for queso, as I was already spending $9 for lunch. 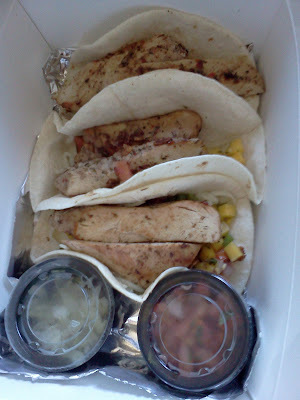 The jerk chicken tacos weren't any better. Advertised as coming with honey-lime mango salsa, jicama jalapeno slaw, and fried plantains, I thought the sweetness of the salsa and the crunch of the slaw would mesh nicely with the spicy chicken. Unfortunately, the generous portion of chicken breast strips were predictably dry, the mango in the salsa was underripe and undersweet, the texture of the shredded jicama was actually somewhat unpleasant, and there was an overwhelming cinnamon flavor that almost overtook the powerful chile and thyme flavor of the chicken. The combination of cinnamon and thyme is what my mother and grandmother would have referred to as "ostry," (UH-strih, with a rolled r), which means "harsh" in Polish. And I had three of these things to eat. Enough of the tacos. Three other types are offered (steak, fish, and black bean felafel) but I feel I've had more than my fair share. Plus, there are other things on the menu, in the form of a salad and some sides - not that I plan to try any of them. Oddly, the charge for adding meat or beans to a salad is $4 across the board, while a side order of beans is only 3 bucks.